Humanity is edging ever closer to full robot mode: three Austrian men have just controlled their new bionic hands with the power of their minds, after muscles from other parts of the body were transplanted and they were retaught how to use them. In the groundbreaking operation, nerves and muscles were taken from the thigh region. And the best part of it all is that, unlike in other similar procedures, surgeons have managed to eliminate the possibility of the body rejecting the new transplant. The three lucky patients had undergone procedures in the period between April 2011 and May 2014. “The decision to let go of his own hand is definitely not an easy one. Why? Because the patient still has a hand. But you must not forget that these patients have lived without hand function for about ten, 15 years and they know what it means to live without hands,” Professor Oskar Aszman of the Medical University of Vienna told journalists of the surgery and study, published in the journal The Lancet. The three Austrian patients had what doctors call an “inner amputation” – they had all suffered injuries in car accidents or in nature that impacted their brachial plexus, the network of nerves that connect the spine to the upper limps of the body. The damage is quite simple. The hand stops talking to the brain. But it is also irreversible. Therefore, what makes the surgery remarkable is that the hand is rewiring the very intricate mechanism - the hand - and making it talk to the brain. The team managed to not only transplant tissue and muscle from a different part of the body, but also connect it to sensors that respond to electrical impulses. "For the first time since their accidents all three men were able to accomplish various everyday tasks such as picking up a ball, pouring water from a jug, using a key, cutting food with a knife or using two hands to undo buttons," The Lancet told journalists in a statement. Aszmann, who invented the technique, explains that it is actually less risky at times than a donor-transplanted hand, which necessitates the use of strong drugs that could lead to health risks. 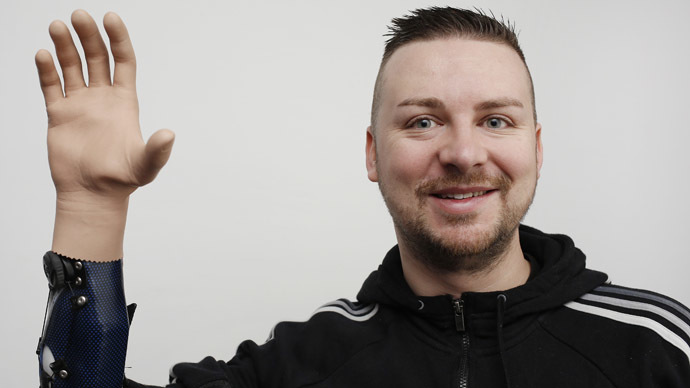 And when it comes to losing a single hand, Aszmann argues strongly in favor of his technique, “because it doesn’t have any side-effects and the quality of hand function being restored with the prosthesis is almost as good of that of a hand transplant,” as he told AFP. He did admit that the research has some ways’ to go toward full control and stability, but for something that’s “just plastic and componentry”, it performs its functions with flying colors. "Existing surgical techniques for such injuries are crude and ineffective and result in poor hand function," Aszmann went on. Milorad Marinkovic smiled at the camera as he waved his new hand and the press took photos. He and the other patients had had to undergo a nine-month preparation to learn to activate the new muscles. That was before learning to control the new hand itself. The surgery, which costs about 15,000 euros ($17,000) and is about the same money as the prosthesis, is a healthy choice for anyone aside from several categories of people, according to Azsmann: "Some patients, in the end, will not be candidates for bionic reconstruction, either because there are not sufficient nerves available for reconstruction or they are psychologically not fit for that, or the environment is just not OK."
Since the advertised operations, the technique has already been used at least once, with success. Although the new sci-fi-like ability to control an entire limb purely with thought is indeed unprecedented, the ability to feel and sense muscle where there is none has been given to the world earlier in February, when a Danish man who lost his hand a decade ago had electrodes implanted into his upper arms, which gave him feedback from pressure sensors and talked to the brain in a natural way. Excellence in intelligent prosthetics has been the aim for quite some time now, and it appears the answers are here sooner than expected. In December 2013, scientists were promising ‘smart’ prosthetics for Iraq and other war vets to be available in only three to five years. But we’re still doing pretty good when it comes to deadlines. The last time anyone saw something like this was in Star Wars.